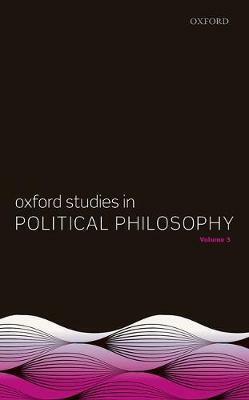 This is the third volume of Oxford Studies in Political Philosophy. Since its revival in the 1970s political philosophy has been a vibrant field in philosophy, one that intersects with jurisprudence, normative economics, political theory in political science departments, and just war theory. OSPP aims to publish some of the best contemporary work in political philosophy and these closely related subfields. This volume features ten papers and an introduction. The papers address a range of central topics and represent cutting edge work in the field. The first two parts of the volume deal with equality and justice and state legitimacy, while the final part looks at social issues that are not easily understood in terms of personal morality, yet which need not centrally involve the state.